Red Nose Day is a major bi-annual fund raising event for Comic Relief in the UK. The red nose refers to a the bulbous scarlet facial appendage worn by clowns and was adopted as a symbol by the professional comedians who started Comic Relief in 1985. The wine business has always been an active supporter, in the past running a parallel ‘wine relief’. For 2009' two Red Nose wines have been launched, both sourced from South Africa’s Saam Mountain Vineyards near Paarl. Red Nose White is a Chenin Blanc and Red Nose Red is a Pinotage blended with some Shiraz (an ancient French cross between Dureza and Mondeuse blanche). 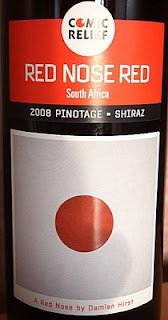 Red Nose Red Pinotage/Shiraz 2008 is a tremendously attractive wine with a scented nose, brimming with ripe loganberry fruit flavours, and an almost jammy sweetness. Tasting notes for the wine from Jancis Robinson MW and Tim Atkins MW read "This hearty and full bodied red brims with goodwill, bramble perfume and raspberry fruit. Drink with friends and partner it with anything you feel like eating." But I think my friend Andy Barrow over at Spittoon has really nailed it. Andy likens the wine to picking blackberries in hedgerows. I went blackberrying last summer and and he has it spot on. The wine costs £4.99 in UK supermarkets of which £1 goes to Comic Relief. But don't think of this as a bargain basement £3.99 value wine. Importers Bibendum reckon that, without the donations of those involved in producing the wine it would be priced above £6. "SAAM, Erbin and Multiprint provided wines, capsules and labels respectively at cost, while JF Hillebrand, Quinn Glass and all of the retailers are working at reduced margins," they say. Good wine, designer art and charity, all in one £4.99 bottle. Rush out and buy.